Island hopping is one of the most popular things to do in Croatia. 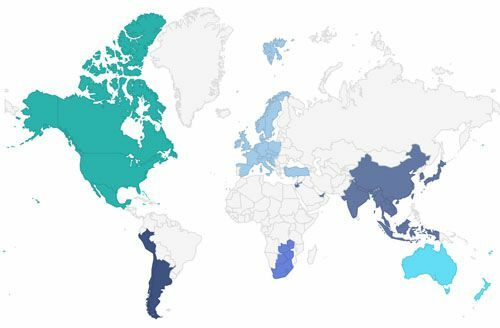 So, how do you decide which islands you should visit? Go to Hvar for luxury and nightlife, Mljet for nature and tranquility, and Vis for its beauty and food scene. 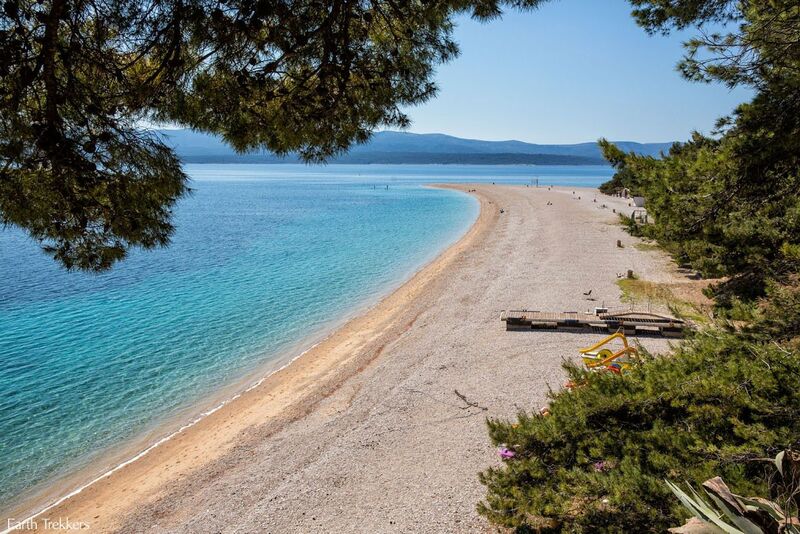 We chose Brac for its hiking and its amazing beach, Zlatni Rat. 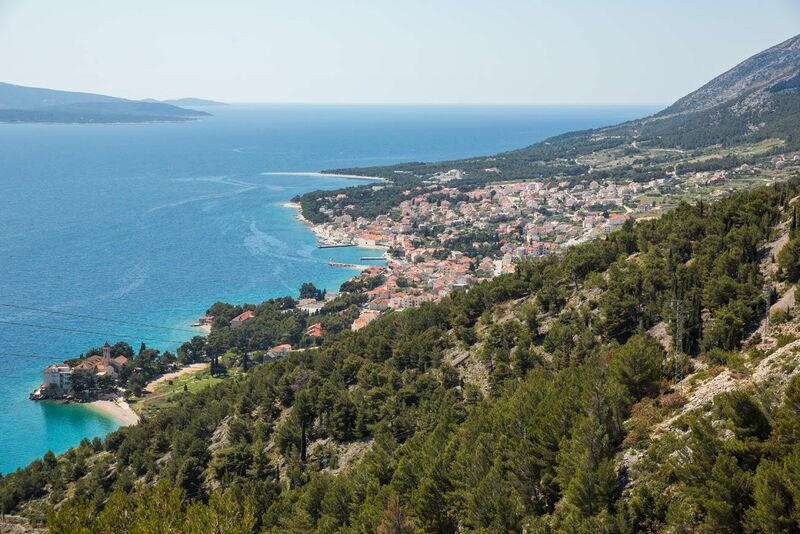 Brac (pronounced brach) is somewhat of an off-the-beaten-path destination in Croatia. 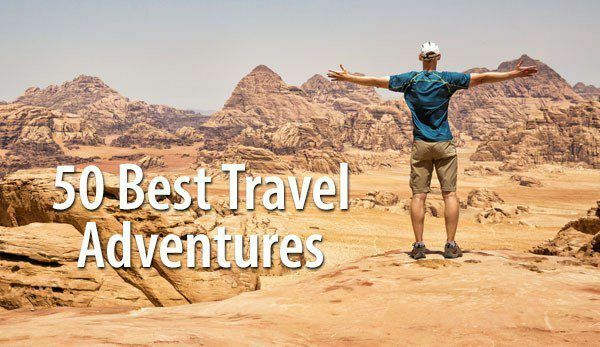 The islands of Hvar, Korcula, and Mljet are more popular choices for most people. 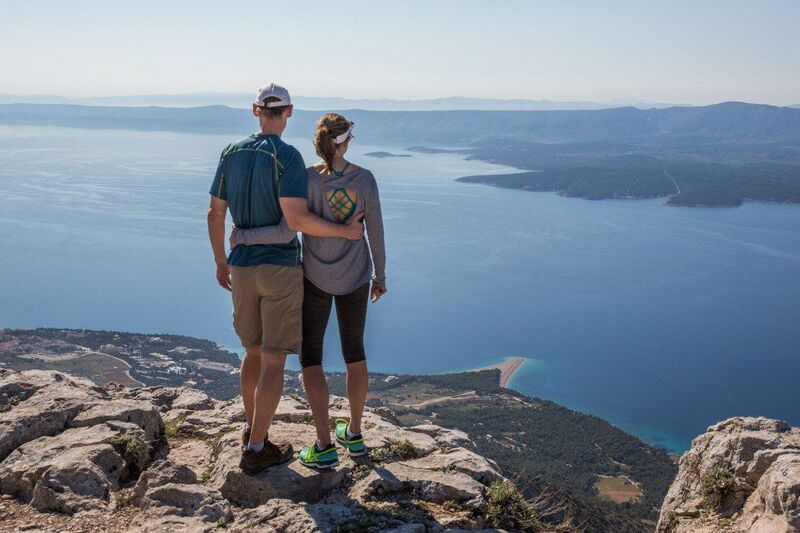 When we learned that Brac is home to the highest peak on the Adriatic islands, Vidova Gora, we couldn’t resist visiting Brac to go hiking. Even so, we did question our decision. 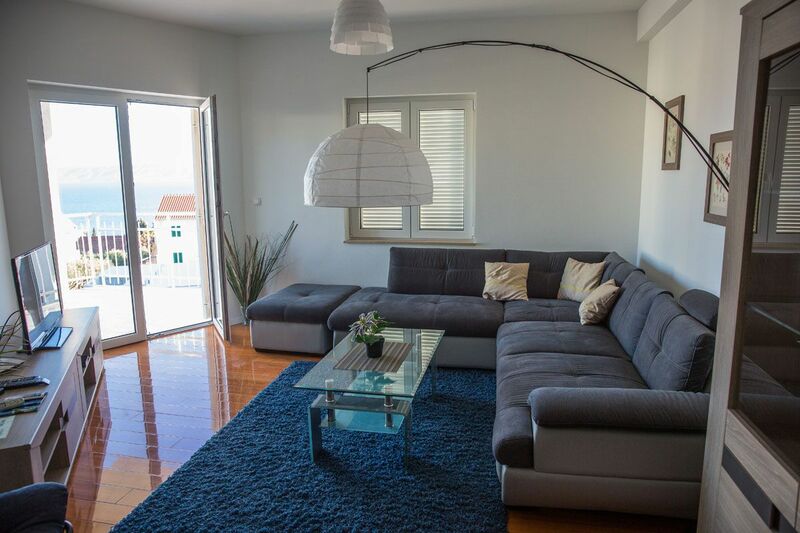 With limited time in Croatia, would Brac be worth it? 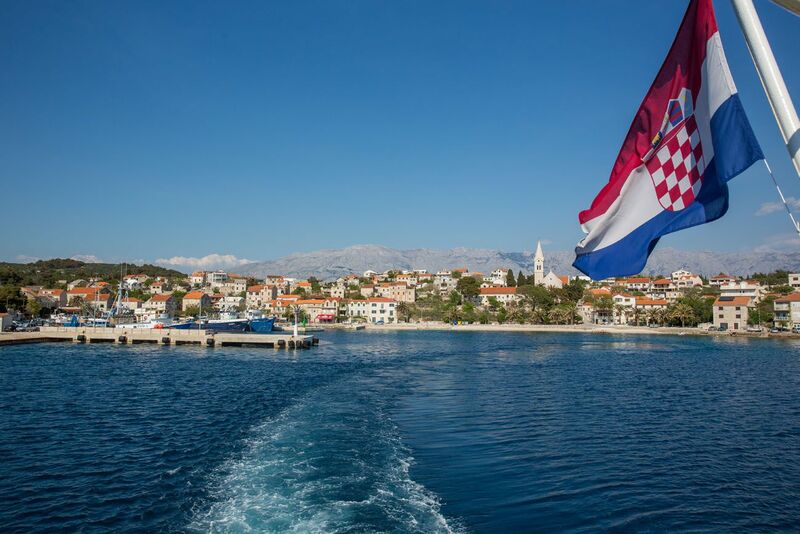 Would our time be better spent at a more popular destination such as Hvar or Mljet? I’m happy to say that Brac not only lived up to our expectations, but the 24 hours we spent on this island was one of our highlights of Croatia. We visited Croatia in early April, one week before Easter. Croatia was really just really coming back to life after a sleepy winter. Some restaurants and hotels just re-opened their doors for the season and most ferries still were not running. But crowds were low and the weather was perfect, with sunny skies and daytime temps just touching 70°F (21°C). From Split, we took the car ferry over to Supetar. Coincidentally, we met up with Julio, our host at the Suncana Villa located in Bol. We talked to Julio during the 50 minute ferry ride, learning about his life in Europe and his love of Brac. From Supetar, it was a winding 40 minute ride across the island to Bol. 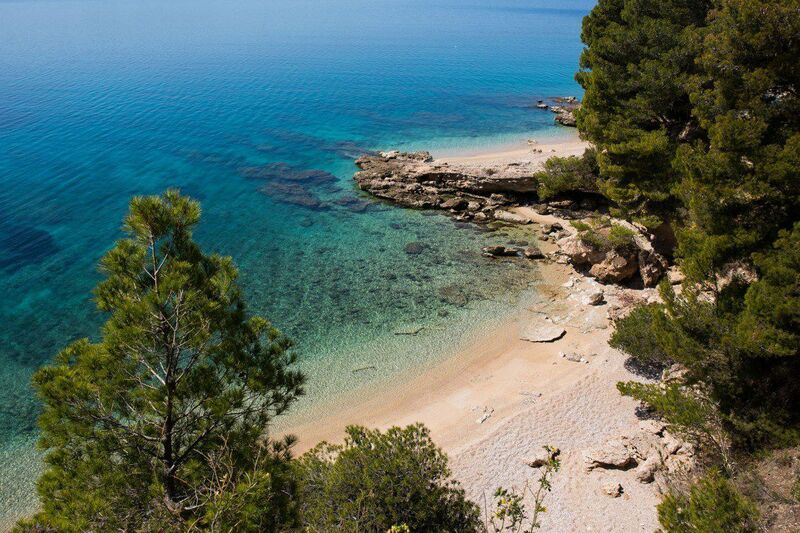 For one night we stayed in Bol, since this town has convenient access to the Vidova Gora hiking trail as well as Zlatni Rat beach.We were Julio’s first customers of the year. In fact, he was still getting the Wi-Fi and space heaters set up in our apartment on the day of our arrival. Yes, daytime temperatures were near 70°F, but the nights still get very chilly, down to 45°F in April. We needed those heaters! For dinner, Julio recommended a local restaurant, Konoba Dalmatino. 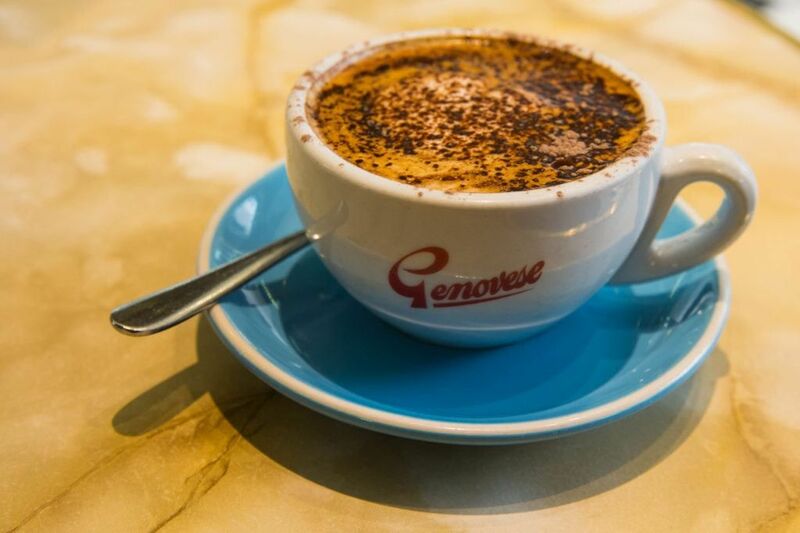 This is a place that is a favorite of locals. It sounded perfect. From our apartment, it was just a 5 minute walk down to the center of Bol. This town is a beauty! Dinner at Konoba Dalmatino was fantastic! 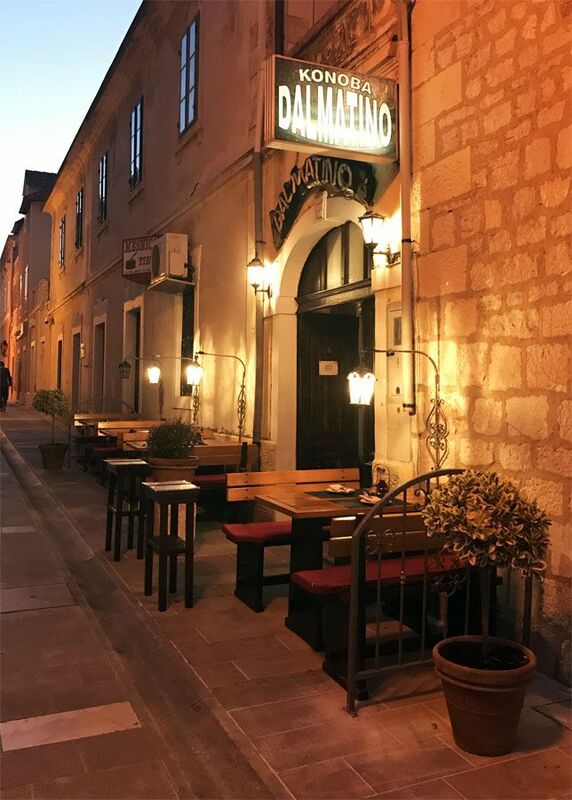 Like many places in the smaller towns of Croatia, this restaurant just opened the day before our arrival. We dined on octopus and veal and seafood risotto, drank Croatian wine, and ate crème brulee for dessert. 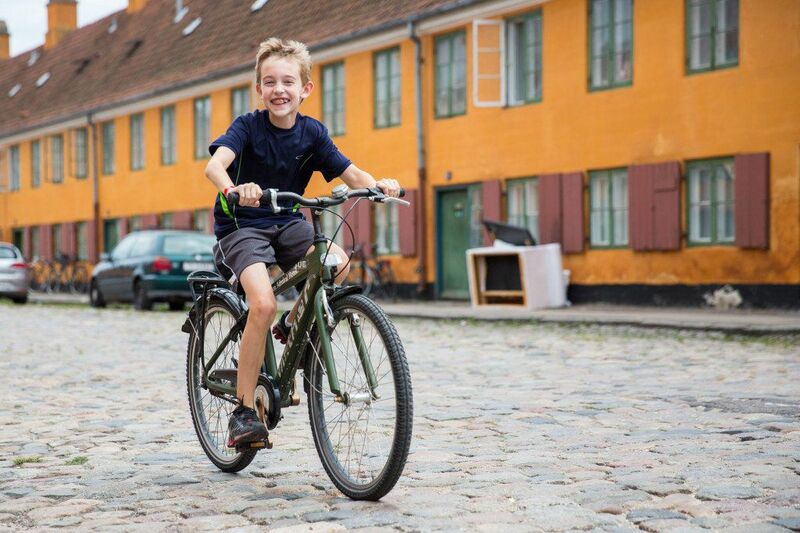 We loved talking with the restaurant owner, who was born and raised in this lovely town of Bol. After dinner, we spent several hours in our hotel room, just vegging out. We were warm and cozy, with space heaters running, relaxing in front of the TV, watching the Discovery Channel. Plopped in front of the TV is not a normal thing for us…but we were enjoying one of the rare moments when we could just sit back and do nothing. Until the power went out. For a few seconds, we all sat there in stunned silence. The space heaters/TV combo overloaded the circuit breakers. Without power, we had no Wi-Fi, and without Wi-Fi, we had no way to email or contact Julio. Tim and I searched for the circuit breakers and found some in the foyer of the apartment building, tucked away behind lock and key. So, at 10:30 at night, Tim and I ran back down to the waterfront. Bol was a ghost town. Almost everything was closed and we had the entire waterfront to ourselves. Fortunately, Konoba Dalmatino was still open. The staff called Julio, who immediately arrived at our apartment to fix our power situation. And, ha ha, the circuit panel was located inside of our apartment, a 2 second fix, only we never found it since it was pitch black when the power went out. Still, it was fun running through the streets of Bol! The following morning the four of us hiked up Vidova Gora. 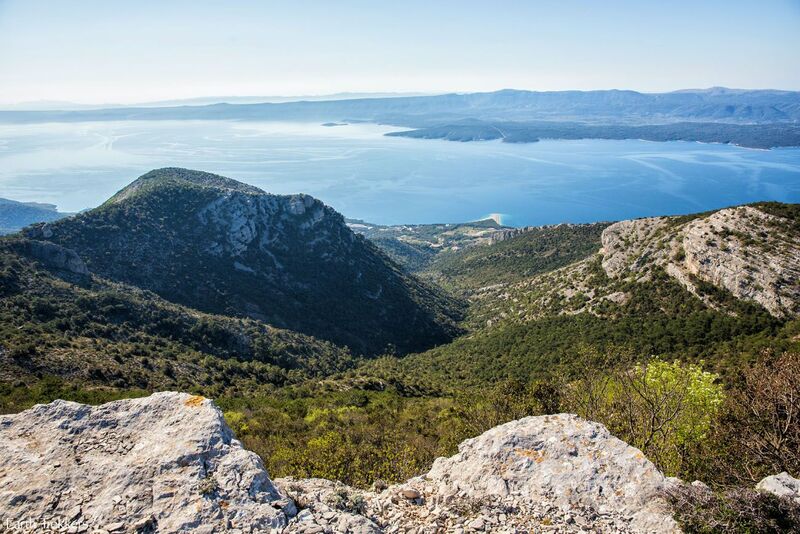 The highlight of the hike is the amazing view over Bol, Zlatni Rat, and Hvar island. Read more about the hike here. After our hike, we visited Zlatni Rat, one of the most spectacular beaches in the Mediterranean. 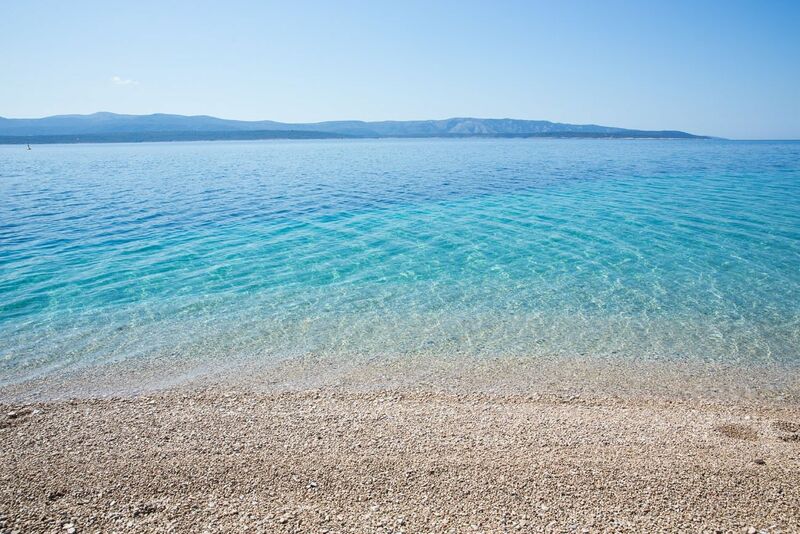 This thin sliver of beach is one of the symbols of Croatia. We wanted to photograph Zlatni Rat with our drone but Croatia has some of the most prohibitive drone laws in the world, so our drone stayed at home on this trip. 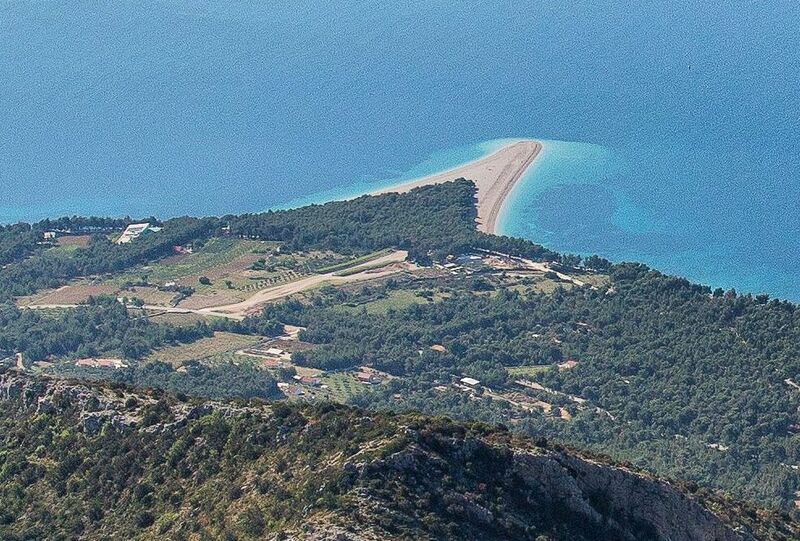 What a shame, an aerial photo of Zlatni Rat sure would have been nice!! In April, very few people are here. It looks much different in the summer months, when the beach is carpeted with colorful umbrellas and sunbathers. Tim, Tyler, and Kara on the tip of Zlatni Rat. Tim’s panorama from the tip of Zlatni Rat. In the early afternoon, we drove to Sumartin to catch the 3:30 ferry back to Makarska on the mainland. Again, it was a beautiful drive. 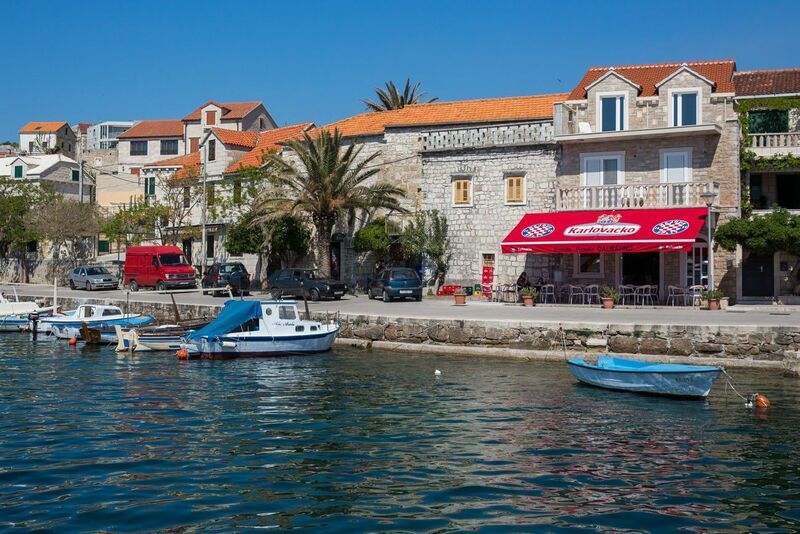 Sumartin, a fishing village, is yet another beautiful town on Brac. I can see why Julio fell in love with this island and why he decided to make this his home. We fell in love with Brac, also. 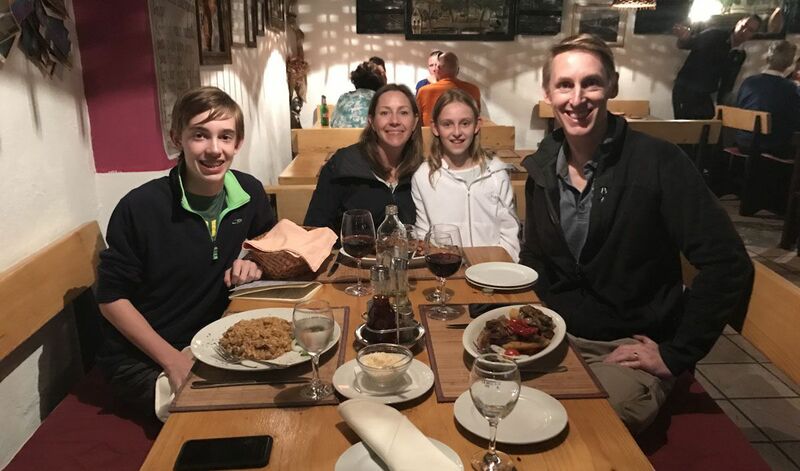 With its quiet coastal towns, hiking trails, fresh seafood, and the stunning Zlatni Rat beach, Brac was the perfect pick for our family. 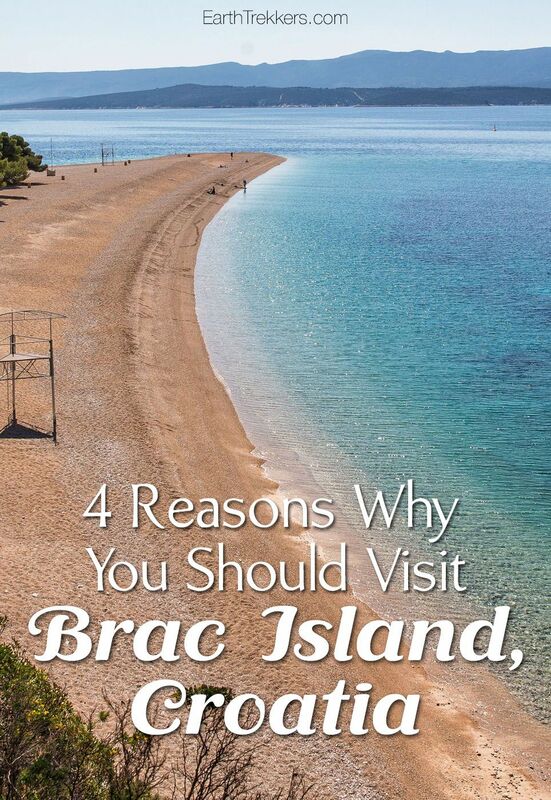 I am hoping we get to return to Brac someday in the future, but we’d also like to explore some new islands as well. 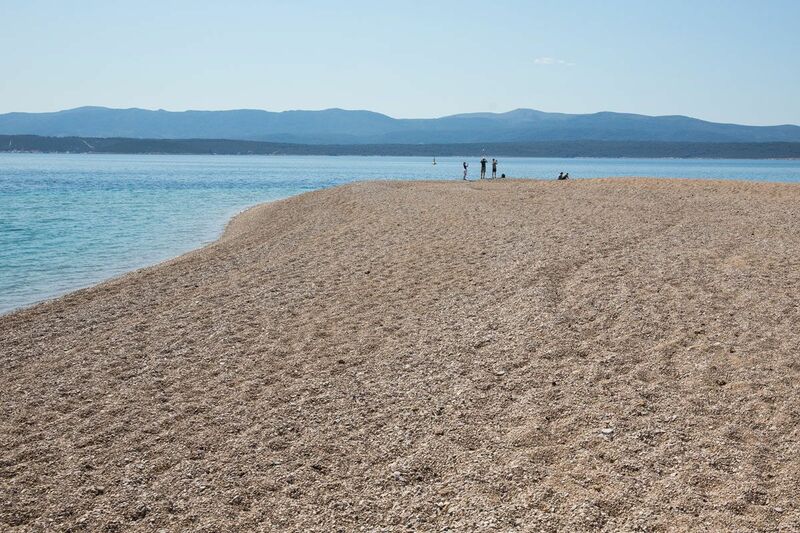 Zlatni Rat (Golden Horn) beach. 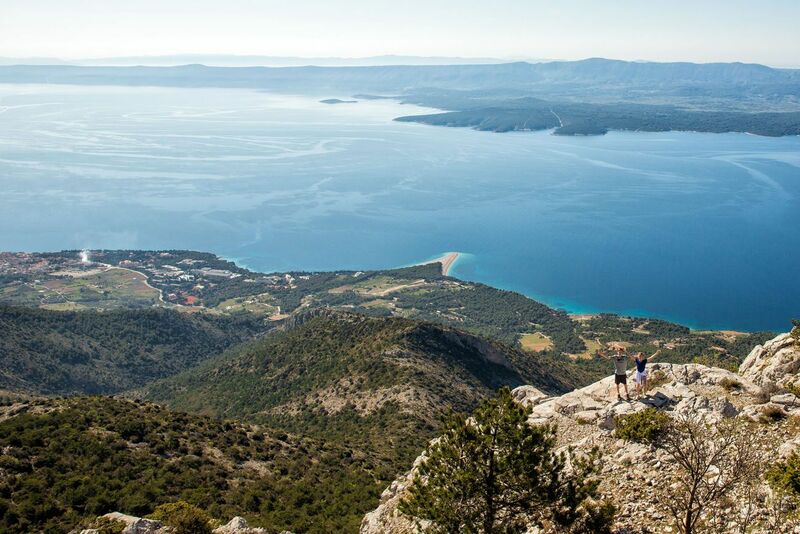 Vidova Gora, the highest point on the Adriatic Islands. 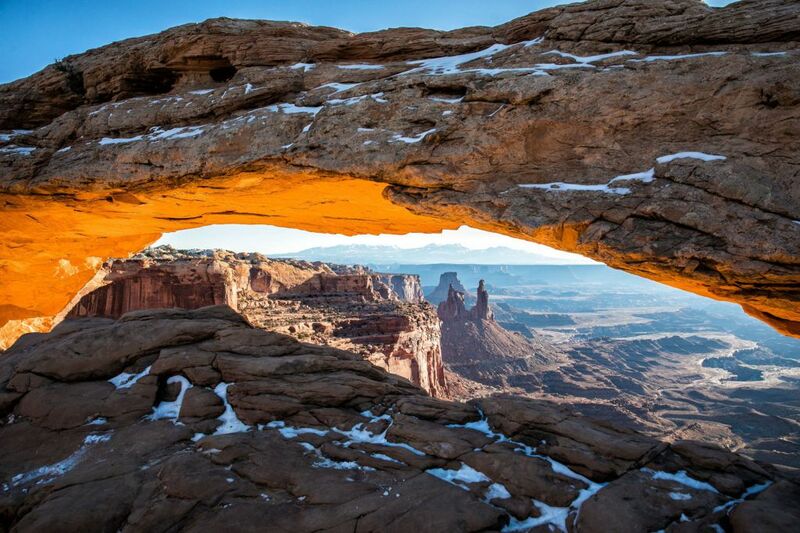 You can hike or drive to the viewpoint. Brac stone. Brac is famous for its stone, which has been used in the construction of the White House, Diocletian’s Palace in Split, and the Parliament building in Budapest. 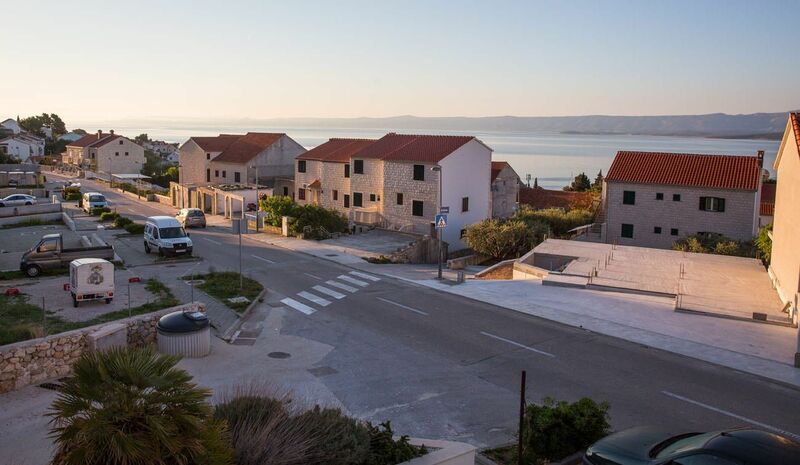 Go “off-the-beaten-path.” Brac has a “local feel” to it. 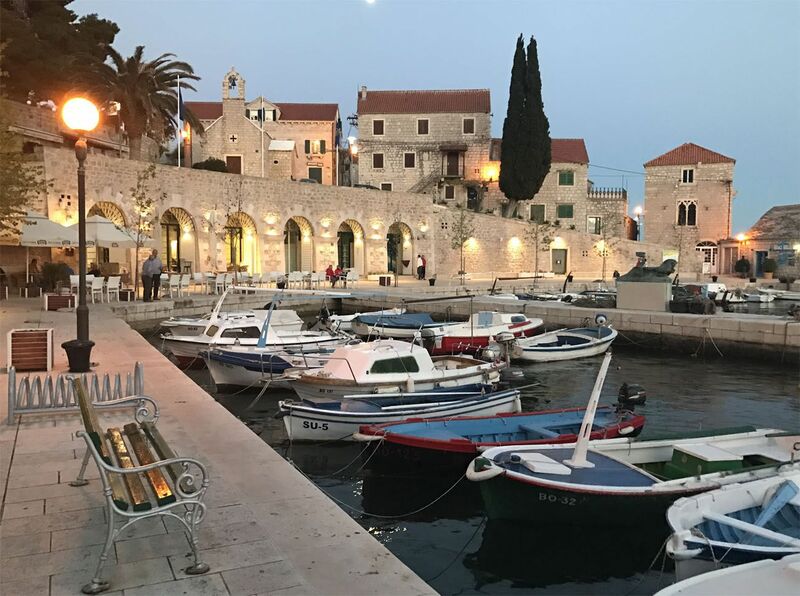 If you want to leave the crowds behind, plan on spending at least one day on Brac, visiting the coastal towns of Milna, Bol, Supetar, and Pucisca. Car ferries link Split (on the mainland) to Supetar (on Brac) and Sumartin (on Brac) to Makarska (on the mainland). 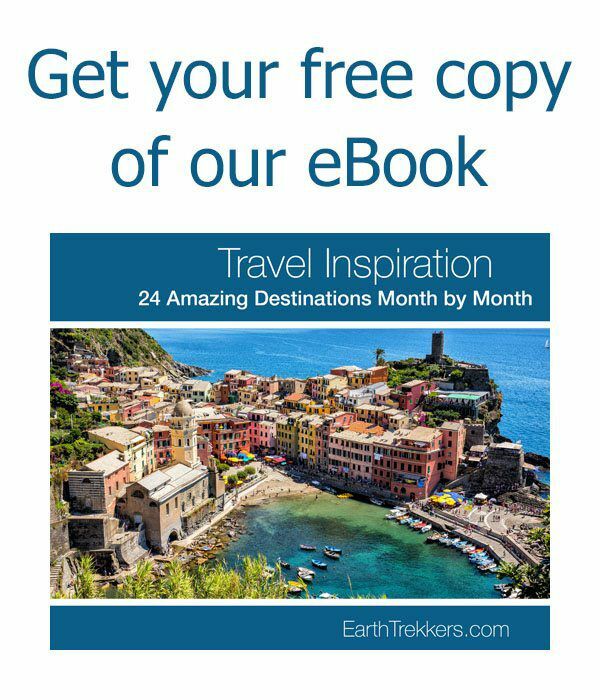 Here is how you can use the ferries on a road trip through Croatia. Visit the town of Split. From Split, take the ferry to Supetar. 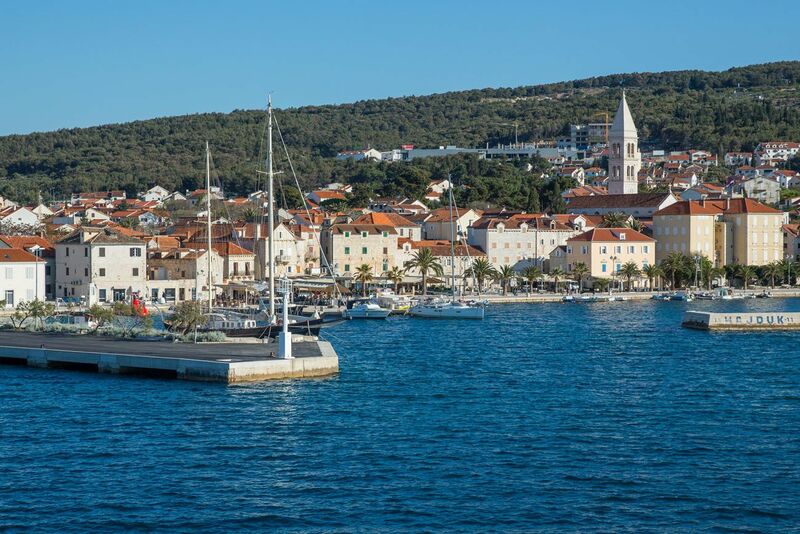 Tour the island of Brac. 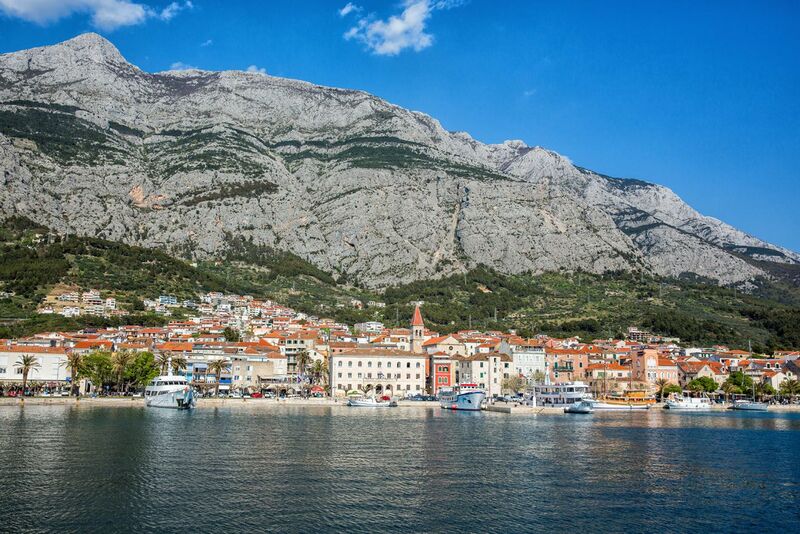 Then take the car ferry from Sumartin back to Makarska on the mainland. Have lunch or dinner in Makarska before driving south towards Dubrovnik. The car ferry is run by Jadrolinija. The ferry from Split to Supetar is very large with room for many cars. The ferry from Sumartin to Makarska is much, much smaller. Even in April, the Sumartin car ferry reached its full capacity. You should arrive at the port at least an hour and thirty minutes before scheduled departure. Park your car in the ferry line and while waiting, you can explore the town. You do not have to wait in line with your car. The ferry will start boarding as early as 30 minutes before departure. We purchased our tickets in advance on the Jadrolinija website. 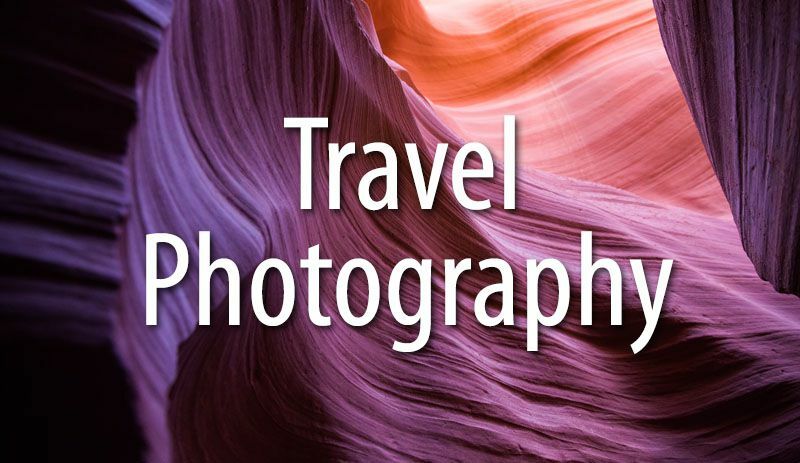 Purchasing a ticket for a specific time slot does not guarantee that you will get that time. Even with a ticket, it is first-come first-serve to board the ferry. If you arrive late, you may not get a spot, and you will have to wait until the next ferry (which could be tomorrow!). 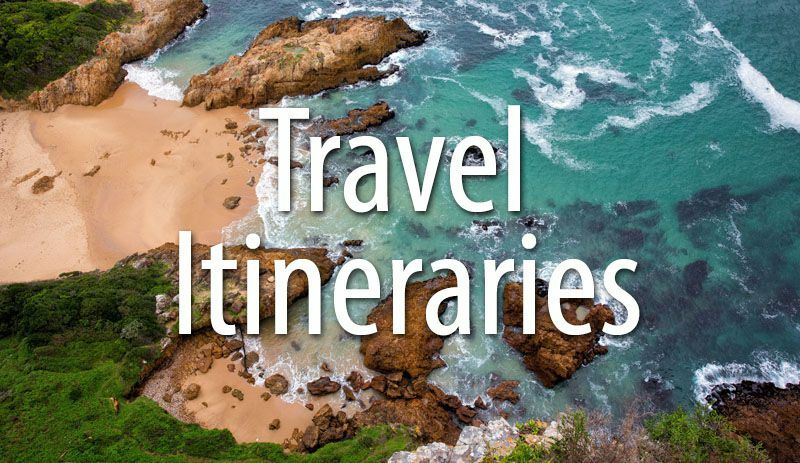 For a full listing of ferries to and from Brac, click here. We stayed at the Suncana Villa apartments. Our two-bedroom apartment was spotlessly clean, quiet, and the Wi-Fi worked perfectly. From our balcony we could look out over the Adriatic Sea. In just five minutes we could walk down to the center of town for dinner. Our host, Julio, went out of his way to make sure we had the perfect stay. When we contacted him about the power outage, Julio responded immediately. With a flip of a switch he turned our power back on, something we probably could have figured out on our own had we looked through the apartment a little more thoroughly. We loved this place and would stay here again on a return trip to Croatia. 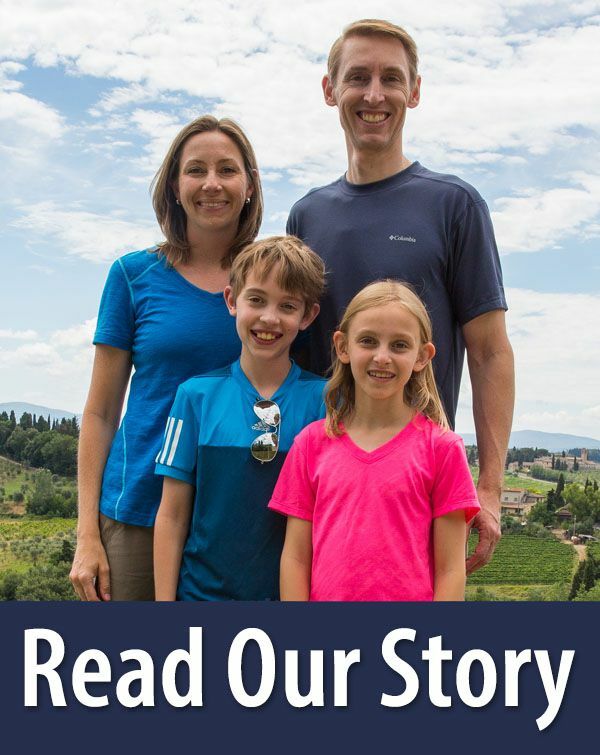 We are heading to Croatia in late June/early July with family and will have about 3-4 days on our own (us plus our 3 children – 11, 9 and 6). Can we keep ourselves (and more importantly our children) entertained on Brac for that long? 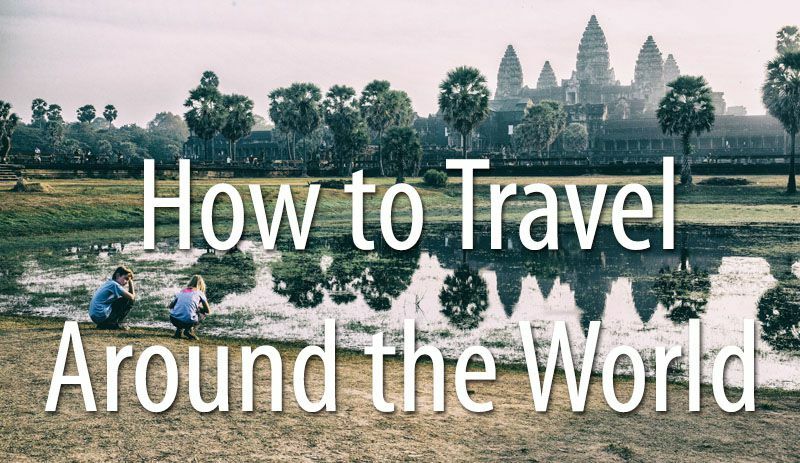 We are debating between Brac and Havar but would like to just pick one place to stay instead of moving twice. Any thoughts or suggestions would be greatly appreciated! Brač is the most popular behind Hvar. The others you mentioned are beautiful but have a lot less tourists than Brač.